Whether you’re going tactical in Iraq, or just traipsing around ‘off the beaten track’, the right clothing will make your life easier. People can spend a fortune on travel tickets, luggage, hotels but often overlook travel clothing. Bottom line – by spending wisely on your travel clothing, you save money in the long run for the rest of your holiday! by spending wisely on your travel clothing, you save money in the long run for the rest of your holiday! Most people would never think of wearing a travel vest, but trust me – it’s the first ‘travel hack’ I’d recommend to anyone. 26 pockets hold everything you can possibly fit – all in custom-sized and ingenious pockets. Two pockets for smartphones/ipods, earbud clips, water bottle holder, ipad sized pocket, rear ‘poachers pocket’ to fit laptop, books etc. 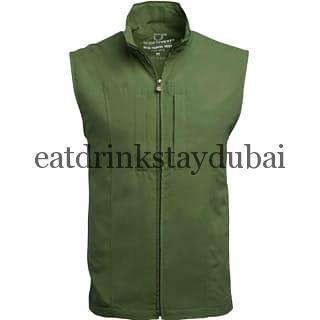 Never again lose anything – carry anything, and everything, with this superb vest. Use Scottevest to keep all items to hand and to breeze past security. Rather than faffing about removing all your electronic items, wallet etc. at the Xray/scanners, just remove the vest and place in it’s own tray. Watch for the envious glances from the security guards. On board, hang the Scottevest from the chair hanger (most seats have them) and then in an emergency, just grab it and run rather than worrying about your case. If you’re anything like me, you want to wear a nice, formal shirt – for meetings, nights out etc. – but can’t be assed ironing. Or you iron a nice shirt, then a struggle to pack and keep it wrinkle-free. What’s so great about these shirts is never crease, never need ironing and always look terrific. I’ve worn these shirts in humid and hot Dubai, and also cold and breezy Kiev, and never felt uncomfortable due to their breathability. In addition to being moisture-wicking, they also stretch 4 ways to fit perfectly. Wherever you are travelling, you need an all-round travel shirt. Comfortable enough to be wearing roughing it, on safari or even instead of a jacket. Fitted with plenty pockets – including a small change pocket for tips – to help keep things out of trousers pockets (phones, pens, wallets). Comfortable enough to wear on its own, or over a base layer in the evenings, this travel shirt gets even more comfortable the more you wear it – and they last forever! Ideal shirt, or light over-shirt/jacket for cooler nights. Comfortable, practical, loads of pockets (including concealed-carry and coins/change) make this an uber-practical must-have shirt for travel. this travel shirt gets even more comfortable the more you wear it – and they last forever. this travel shirt gets more comfortable the more you wear it – and they last forever! Don’t make the mistake of thinking you should only consider a base layer in cold weather. As an added bonus, they look just as cool as an outer layer as they do a base layer! Lightweight, breathable, odour resistant, moisture-wicking and will keep you fresh all day. Ideal also for swimming, and include two ‘secret’ pockets for money, passports etc. When you’re looking for travel socks, don’t make the mistake of buying thin socks. Thicker socks – of the right materials – will still allow your feet to breathe whilst wicking moisture away, with the benefit of being more comfortable. I’ve worn these socks traipsing around the Emirates A380 Business Class bar, with thick boots in Yemen, and with business shoes in Dubai, and not once did they let me down. Simply superb socks – without a doubt, the best socks I’ve ever worn. Keep your feet fresh – no odour – as well as comfortable, whilst socks stay in place (no wrinkly ankles!) no matter how far you walk/travel. When you’re looking for travel socks, don’t make the mistake of buying thin socks.